We'll use Van Gogh's Flower Beds in Holland as an example of how to cite images in APA, which changes depending on where you found the image! Van Gogh, V. (1883). 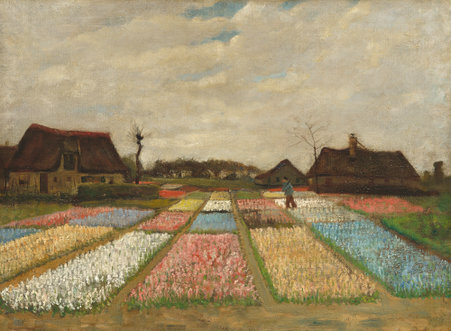 Flower beds in Holland [Painting]. Washington, DC: National Gallery of Art. Artist's name. (Year). Title of Artwork [Medium]. Location of the institution that houses the artwork: Name of Institution. Artist's Name. (Year). Title of image. Retrieved from URL. Image found in a book: Just cite the book! Naifeh, S., & Smith, G. W. (2011). Van Gogh: The life. London: Profile. Authors. (Year). Book title. City it was published: Publisher. Image found in a journal: Just cite the journal! Bailey, M. (2009). Ploughing his canvases. Apollo: The International Magazine For Collectors, 170, 99-101. Author (Date). Title of article. Title of magazine/journal, volume, page-page. DOI (if there is one). The important thing to remember is that your in-text citation matches the citation on your References page. In all the examples above, the author's name appeared first in parentheses, and first in the full citation. If you don't have an artist name, use the title of the image! Just make sure the first word in parentheses matches the first word in the full Reference, and that the dates also match! Original Author/Creator. "Name of video." Site where it was found, uploaded by Username (unless it's the same as the author/creator), date posted, URL. Date accessed. Name of Creator and/or [Username]. (Year, Month Date). Title of video. [Video File]. Retrieved from URL. Are you trying to cite a TV show, movie, etc.? Check out this Owl Purdue guide!